Found 8 file extension associations related to Lotus Symphony and 7 file formats developed specifically for use with Lotus Symphony. 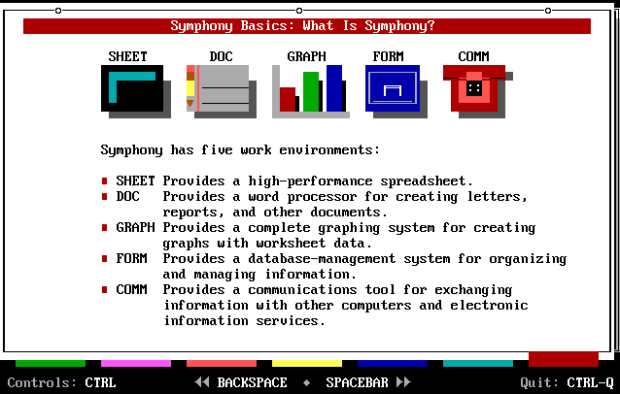 Lotus Symphony was an integrated software package for creating and editing text, spreadsheets, charts and other documents on DOS operating systems. It was released by Lotus Development as a follow-on to its popular spreadsheet program, Lotus 1-2-3 and was produced from 1984-1992. It is not related with the latest IBM Lotus Symphony. The Lotus Symphony software seems to be old or discontinued. If you need more information please contact the developers of Lotus Symphony (IBM), or check out their product website.